Calling all pie and mash addicts. Manzes in Chapel Market is about to close due to rising business rates. Some Islington businesses have had their rates increased by 45 per cent. I remember this shop from when I was a kid and used to gawp at the trays of writhing eels outside. You never know, they might find a wealthy benefactor. I saw this on Facebook recently on both Islington pages and the 'pie and mash appreciation society' page. Probably like most here I visited the shop for over 50 years and did so until last year when I had pie and mash there and thought that it was different. I asked if their recipe had changed, they said no; who am I to argue. I haven't been back. I now use Manzes in Tower Bridge Road or Sutton High Street. They in my opinion are much better. 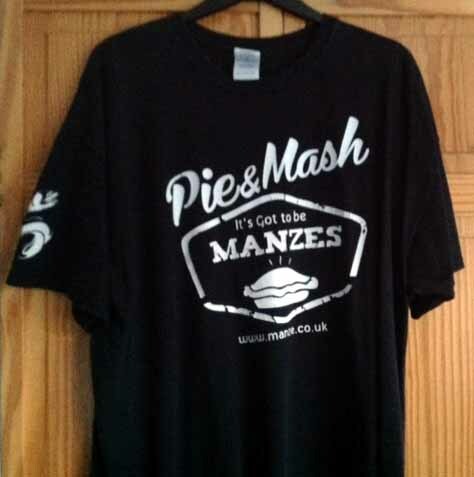 I also have it delivered by www.manze.co.uk or www.peterspiedelivery.co.uk, both down here in Alverstoke and when in Spain. I am sad to hear that the shop is closing, but I guess with the changes in the population of the borough and it's gentrification there are less and less people using the shop. I can still remember two Manzes’ in the market. It was also a Saturday treat with my sister, Mum and Nan. I think it cost one shilling for pie and mash and my Nan always had stewed eels, mash and liquor. Went up there about six months ago, but not the same. I always thought the best one was Exmouth Market but that also closed down. Even my one, Kelly's in Roman Road has shut for so called improvements. I think it won't open again; what a shame. Another landmark going. I went there some years back could have sworn that the spoon on the bit of string on the counter was the original from years ago. I also went to Manzes and saw the spoon on the counter; it's the original. Many year's ago for one shilling we could eat a delicious pie and mash. I'm sad that they’re going to close. Business rates are set by the government. I recall Manzes in Chapel Street market with many fond memories when I lived in Islington. I use to eat both pie and mash and hot eels. There was also one at Dalston near the junction, at the end of Ridley Road market. Health & Safety I suppose, won’t let you have sawdust on the floor like most of them use to have. There is a good one in Deptford High St. So when we go to The Lord Hood to see the jazz we can go there first. OK. Surely central Government set business rates. Local councils only collect it, irrespective of which persuasion. Wasn't the one legged man the peanut man outside Manzes? Yes he was Michael and there was a stall that sold hot sarsaparilla? Ribena? Sarsaparilla was sold as a pick me up at the Chemist in Holloway Road, just along from Eden Grove, 2d for a small glass, 6d for a large glass, cold in summer, hot in winter. I loved it, but in Sussex nobody has even heard of it. I remember the one legged man who used to sell live eels outside Manzes and chop them in front of you. I also remember the small pie and mash just round the corner just off Chapel Market but not as good as Manzes. I have found a pie and mash down here on the south coast in Tuckton. Using home made but definitely upmarket pies, great liquor and mash and chilli vinegar. Not quite the authentic taste but better than driving one hundred miles. I used to have 1/3d a day for my lunch & sweets and as pie & mash was the same price as a school dinner, I went to Manzes every day. The one that is still there also sold a rhubarb fruit pie for 3d. The other Manzes sold a plum pie. So depending on what fruit pie I wanted, determined which shop I went to. One day, the price increased to 1/1d for pie & mash, so I had to forgo the fruit pie. As I was about to leave I was asked why I wasn’t having a fruit pie and when I said that I only had 1/3d a day, I was only charged 2d for the fruit pie and never paid more than 1/3d for my lunch there. I stopped being a regular when I went to BB. I had lunch in Chapel Market Manzes back in March, it wasn’t as I remembered it. The next day I had lunch in Manzes Hoddesdon, which is a branch of the Walthamstow Manzes. That was much better and I told them so. It turns out that they also owned the one on Chapel Market. You may remember Charlie, bald and had a bad hip that made walking difficult. He lived not far from me in Cheshunt. When he retired, I saw him hobbling about and got chatting. He gave me the recipe for the liquor, which I still make, when I have pie & mash at home here in Cardiff. I’m getting married in November and when I suggested we could have pie & mash at the wedding breakfast, I got a look that could have been from Medusa. Sarsaparilla was a great tonic drink, either hot or cold. Glad to see you could spell sarsparella, Barry. Did I get it right? I have fond memories of Chapel St Mkt as a boy working on Charlie Strevens comic stall (David Strevens uncle) and pulling the barrows in to Cloudesly Road news, now million pound new houses. I worked in Maulklins butchers next to Connors fish shop as a lad, Saturday’s and school holidays, then later full time opposite I think it was Gunners? Butchers where Terry Eyles worked. I was not a great pie and mash man myself and absolutely hated jellied eels. More a fish and chip person. My great treat as a little boy was to meet my Mum on Tuesday dinner times and go to Woolworths and sit on a bar stool and have a banana milkshake and if Mum had enough money I would have a hot jam doughnut, the one with a hole in the middle, then help her carry the shopping bags home. Oh those happy days. If I remember some Woolies had Wimpys in them; the one at Brighton did. The Eastbourne Wimpy only went a few months ago, redevelopment, infinitely better than McD’s. There was a fish shop in Blackstock Road that sold live eels, you could see them slithering round in grey metal boxes, horrible. I was never a fan of pie and mash, pie and chips possibly, but NOT green parsley liquor. I assume there are other things in it? Our BBS English Language teachers would give you eight out of ten for (mis)spelling ’sarsaparilla’. Probably E for Effort. Not to worry, though - there are many other variations floating around. Would Peter Strevens (see image, 1960) be a relative of Charlie and David? Peter was a whizz-kid and went on to great heights (I believe). Woolworths evokes unpleasant memories for me. I had my first Saturday job there. I reported for work early and met Mr. Barnes, my supervisor. No first name terms – he was to be referred to only as “Mr. Barnes.” To say the least he was tyrannical; holding sway over all the lowly personnel. My duties were specifically to help keep the store clean and perform any odd jobs. At certain times of the day, I was required to sweep all the floors and dispose the accumulated rubbish. Initially, my technique of sweeping wasn’t to Mr. Barnes’ liking – not vigorous enough. So after a lecture I put more muscle power into my sweeping to satisfy him. This routine was necessary at the end of the business day after the doors were locked. I could hardly wait for knocking off time as I was absolutely knackered – all for one pound (£1/0/0d) a day gross, or 17/6d take home pay. After a few Saturdays, my mother started to become concerned with my exhausted condition as a result of the day’s work. She was even less pleased when I told her that one of my duties was to take the daily cash takings to a nearby bank. The money was put into a locked attaché case and strapped to my wrist. Mum envisaged that I would be robbed; perhaps injured, and was seriously considering that I should give up this job. However, things came to a head when the store’s management wanted me to work full time during my school holidays. Mum told me to refuse this request, and I was summarily fired on the spot (“We’ll have to give you your cards” is the euphemism) – actually much to my relief. Not so Happy Days!